Much like a favourite bar and a good book shop, a local record store is an important addition to any functional neighbourhood. On the island where I live in Copenhagen, there’s only one. Two if you count Amagers only bookstore, Zittans; they carry a selection of records too, but a limited selection, the main focus being books of course. But one is enough especially when it’s as friendly and welcoming as Amager Records. 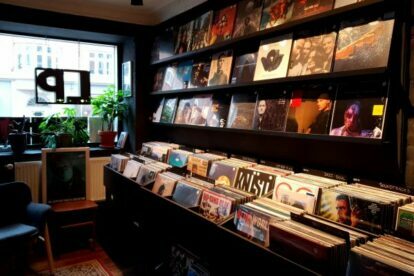 The store is small and cramped, as it should be, leaving little room to manoeuvre when you find yourself flipping through records with three other music enthusiasts. In addition to selling new releases, the owners Niels and Jan have a flair for getting their hands on really good second-hand collections which quite often contain hard-to-find records. I like jazz-infected music and luckily for me, Jan shares a love for contemporary jazz. On my visits to the store I have been introduced to several exciting artist and albums within that genre: he holds up the covers, I take pictures, go home, listen, come back and buy the album.